If your child has food allergies, please download the allergies form by clicking the link below. Our Library is selling books in order to make room for new ones! Books will be $1, $2, and $5! Most of these are Accelerated Reader Books! Parents and Teachers can take advantage of these great deals. Come see us! Agent Larry Rivers warned our students about the dangers of drugs. base his beliefs and choices for the future." "OLF is a wonderful, racially-diverse school which not only teaches Christian principles but also teaches love and acceptance of others, as well as develops self-esteem and creativity. My daughter attended OLF and my husband and I were very pleased." "OLF is a great school. 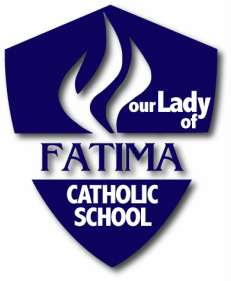 I have been here at Fatima for 9 years now and loving it. I love how all the teachers helped and encouraged me to do better. Fatima is challenging, but is really helpful and makes learning fun. They definitely know how to prepare you for the future!"